“Seventh grade is the most awkward of grades. Hormones rage, tempers flare, and parents and teachers all too often enjoy the brunt of it all. Despite all of that, or maybe because of it, Katie and I found each other in the seventh grade. Well, so we weren’t in seventh grade. In the spring of 2005, just months after graduating from the University Of Missouri, I found myself teaching seventh-grade English in inner-city Houston. Katie had just graduated from Kansas State and, like me, was leaving all that was familiar to her and hoping to make a difference. ryan told us of long (yet exhilarating!) hours just down the hall from katie’s home room, and wanting so very much to get to know her. . .
“By January, I was definitely interested in Katie – she was so beautiful, she made me laugh, she was brilliant and we shared a lot of interests. She was also from the Midwest, and even though she was a K-State fan and I had grown up in Columbia a staunch Tiger, she was still the perfect woman! ryan, we’re so glad you passed Katie that note, and especially happy that, a year later, you passed your application on to us. we can just picture you two there in the classroom, giggling in the back row! thank you both for your commitment to kids and for sharing your story. 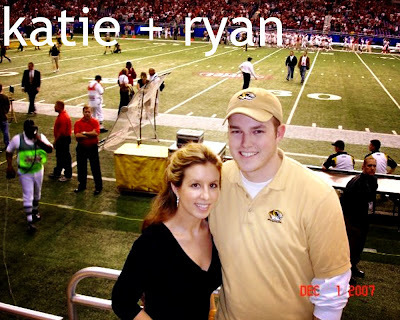 whether you end up marring in austin (note: where the couple now resides, and where katie goes law school) or even manhattan, kansas ☺ ~ we admire you two and are inspired by your dedication to kids and your dedication to each other. and now we’d love to hear from your friends and family – tell us folks, how did these two win YOUR hearts?